I like this one. 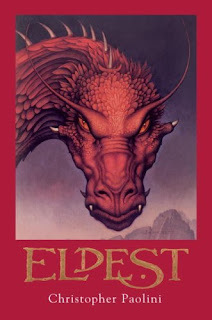 I think, in this one, Christopher Paolini's writing style made it to adulthood. It doesn't have stiff or contrived dialog, not as much as the first one. Yeah, there's still a lot of Star Wars paralells, and some derivative characters, but I like where he's taking things, especially as Eragon matures in his use of magic. I'm excited to see where it goes in the future. There are elements of mystery in here, as he uncovers and learns secrets from the past, and it left me wanting more. Also there's a parallel plot involving his cousin, Roran, that I thought was gripping. Of course, he leaves one plot hanging and switches back to the other, but I had a hard time putting it down. Of course, I know people who got bored. It's not a fantasy book for everyone, but I liked it, and so did my wife, who's not a fantasy guru. She got bored by Lord of the Rings, which I think is awesome. The audiobook is good. The narrator is the same as the first book, and he also seems to have settled down a little in his style. Out of 10 (Harry Potter being a 10 of course) I'd give this audiobook about a 7.5.